Samsung has a large and growing selection of accessories for its many Android devices, ranging from spare battery chargers to Bluetooth headsets and replacement parts. It's also crammed with various covers and cases, some of which even provide an extra degree of functionality. 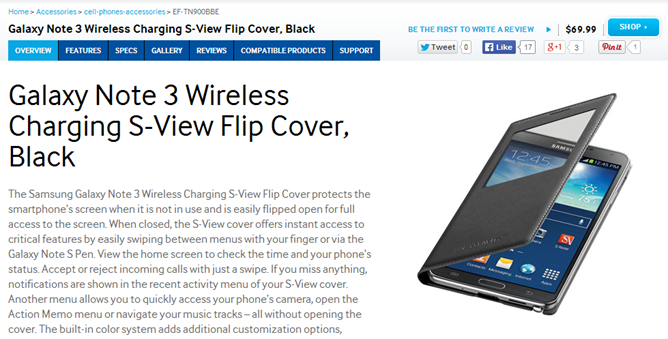 That is especially the case (giggle) with the Galaxy Note 3 Wireless Charging S-View Flip Covers that are now finally available from Samsung's online shop. This product combines the official wireless charging cover and the S-View Flip Cover into one, making the Galaxy Note 3 the first to receive this combo. Samsung only offered one or the other for the Galaxy S4 and the Note II, but not both. Like the S-View Flip Cover, this case has a transparent opening that provides access to the time and other information without having to flip it open. The back supports wireless charging. This functionality doesn't come cheap, though. You're looking at handing over $69.99, and that 50% off code won't work here. 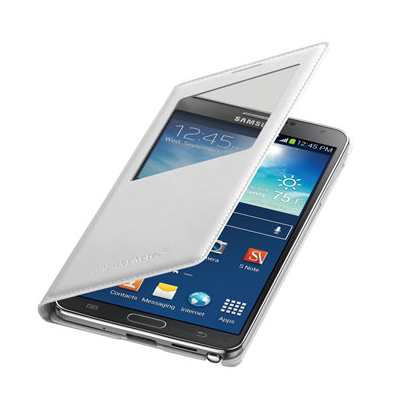 But if you remain undeterred, the Galaxy Note 3 Wireless Charging S-View Flip Cover is available in black and white. Links to both options are available below.